My father always says that the most important quality a cook must have is patience. With risotto, this is even more crucial, as the cook may be tempted to turn up the heat in order to reduce the constant stirring. But the results are always worth waiting for! The trick I use when putting bacon in risotto is to fry it separately until it’s crispy and then add it back in at the end, rather than letting it simmer with the rice, as it tends to lose crispiness and flavour (a travesty!). The spinach, too, should be added only a few minutes before the end, so it is just wilted but doesn’t disintegrate or lose the fresh green colour. I prefer baby spinach, which is more subtle when wilted than the normal spinach leaves with gigantic long stalks. Some people make the chicken stock in a separate saucepan and keep it simmering on the stove whilst adding to the risotto. As I use chicken stock powder, rather than cubes, I prefer adding the powder directly to the risotto along with water from a boiled kettle. It saves a bit of washing up! 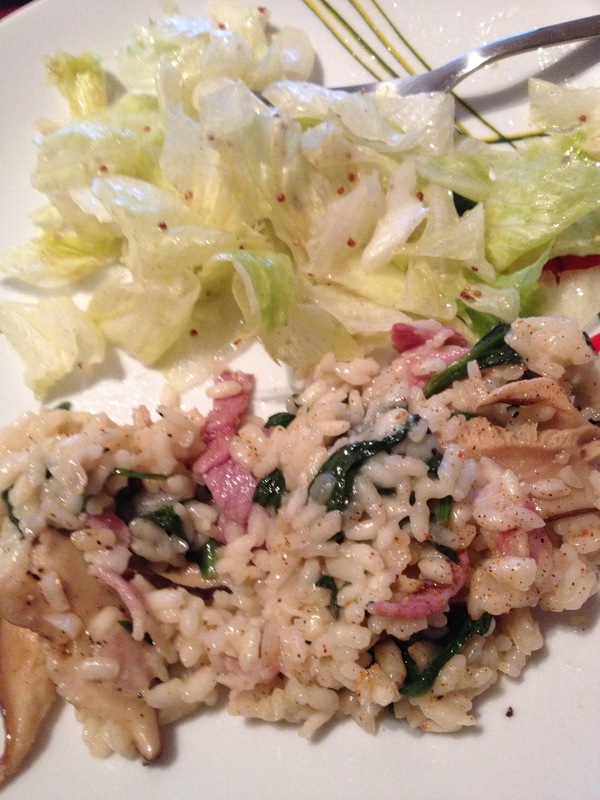 We paired the risotto with a simple green salad, dressed up with my usual mustard vinaigrette – a winning combination! 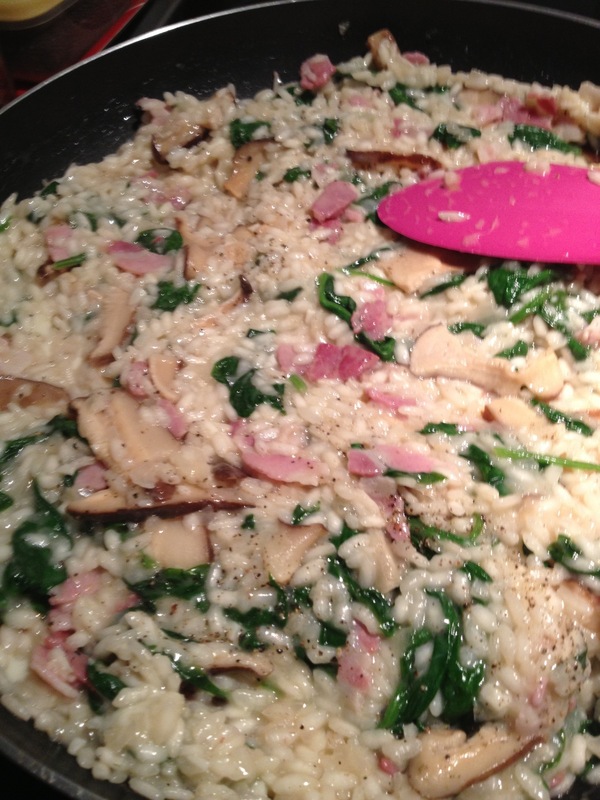 Risotto is time-consuming but very easy to make – just follow these steps! 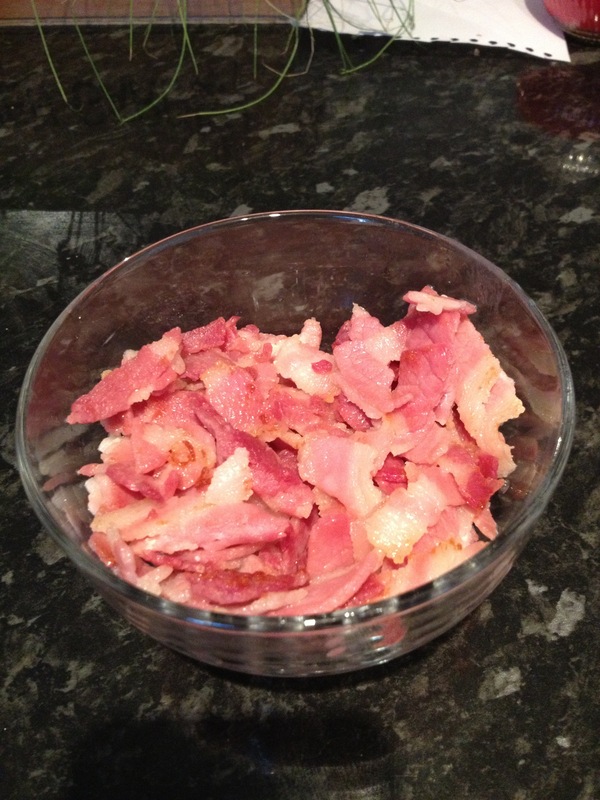 1) Fry the bacon pieces on high heat in 2 tbsp olive oil until crispy (around 5 minutes). Keep aside. 2) Soak the dried shiitake mushrooms in a bowl of cold water. 3) Add the butter to the leftover oil and fry the onion for 5 minutes on medium heat, stirring frequently, until slightly browned. 4) Add the garlic with 1 tbsp olive oil and fry for 1-2 minutes until fragrant. 5) Add the risotto rice and stir for 2-3 minutes until it is slightly translucent. 6) Add in the wine and stir until it has evaporated (a few minutes). Then add half the chicken stock and stir slowly and continously until it evaporates. Add more as necessary (500ml in total). As you stir, add in some freshly ground black pepper and a pinch of chilli powder. Keep the heat to a medium, so the liquid is simmering but not boiling. 7) Taste the rice after 20-25 minutes and add more water and cooking time if necessary. When it is al dente, add in the mushrooms and stir for 2 minutes. Then add the spinach bit by bit until it is wilted. 8) Add the bacon into the pan, stir and then sprinkle with mozzarella. Once the cheese has melted, garnish with more black pepper and serve! It IS! Haha – thanks for checking out my blog 🙂 There’s more where that came from, so feel free to look at all the recipes and be inspired to cook something yourself!